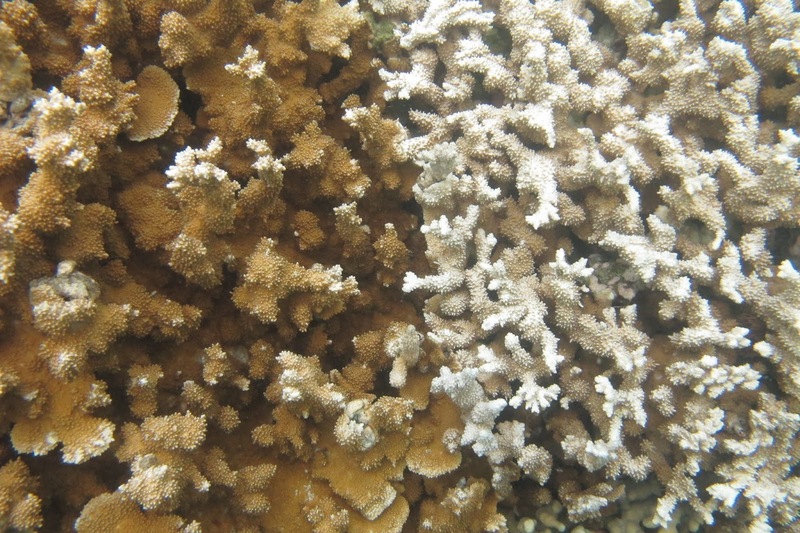 Corals in Kane`ohe Bay seem more resilient to bleaching in warming waters today than they were 50 years ago—the first evidence that coral may be gaining tolerance to rising global temperatures. It may not be enough to keep up with the pace of climate change, but it's a hopeful sign. A complex study by University of Hawai`i and Bishop Museum researchers looked at how corals responded to hot spells in 1970, and then in 2017 when the research team repeated the earlier studies. They found that corals today take longer to respond to superheated water, that they recover more readily and start growing again more quickly. There are caveats here, but the indications are hopeful for the future of our reefs. The new study in the journal PeerJ: The Journal of Life and Environmental Sciences, is entitled "Evidence of acclimatization or adaptation in Hawaiian corals to higher ocean temperatures." The authors are UH Institute for Marine Biology scientists Steve L Coles, Keisha D. Bahr, Ku'ulei S. Rodgers, Stacie L. May, Ashley E. McGowan, Anita Tsang, Josh Bumgarner and Ji Hoon Han. Coles, a veteran coral scientist who also works with Bishop Museum, was part of the original 1970s study. Science Daily reported on the study. Reef corals are two-part organisms. The coral polyp provides a home to single-celled algae called zooxanthellae. It's a mutual relationship, and corals get both their color and some of their food from the algae. When corals are stressed, as when water temperatures rise, they eject their zooxanthellae and begin to starve. They also look white, bleached. The 1970s experiments studied how corals responded to periods of abnormally warm water. The 2017 experiments recreated those studies. "Re-running a 50-year old experiment using the same coral species, same experimental setup, and same observer allows us to directly test changes in coral temperature tolerance,” said co-author Keisha Bahr. After nearly five decades of increasingly warm oceans, those corals seem to behave differently now, the team said. They keep their zooxanthellae longer, and recover quicker after waters return to normal temperatures. The warming trend has been carefully tracked, and offshore sea temperature rise amounts to 1.13 degrees Centigrade from 1958 to 2014, the report says. Why are the corals more resistant to warming? It isn’t clear whether that's because corals are adopting more resilient zoozanthellae or whether the corals themselves are more temperature resilient. And Coles warns that it might also have something to do with cleaner waters in Kane`ohe Bay, where in the 1970s, nutrient-rich secondary treatment sewage effluent was being dumped in the bay. "Elevated levels of dissolved nitrogen have been implicated in stimulating coral bleaching," Coles said. "Available evidence indicates that the lower concentrations of nutrient pollutants, particularly dissolve organic nitrogen, have played an important role in the increased temperature tolerance of corals after nearly 50 years as was determined by these experiments," the paper said. In other words, corals can respond better to change when the water is cleaner. This evidence from a single location is important in a special way, the authors said. "Our experiments are the first to demonstrate thermal acclimatization/adaptation to elevated ocean temperature for corals of the same species and from the same location over the past half-century." The three species of corals they studied are Lobactis scutaria, mushroom or plate coral, Montipora capitata, called rice or pore coral, and Pocillopora damicornis, the cauliflower or lace coral. They've been taking temperature measurements at San Diego's Scripps Pier for 102 years. And on Aug. 1, 2018, they measured the highest temperature in all that time: 78.6 degrees. And summer's not even over yet. The same day, a half-mile offshore they measured 79.7 degrees, second highest at that location after a 2015 El Nino year measurement. Yeah, that's just one location, and you can get isolated peak temperatures, but large scale temperature data continue to move in one direction. 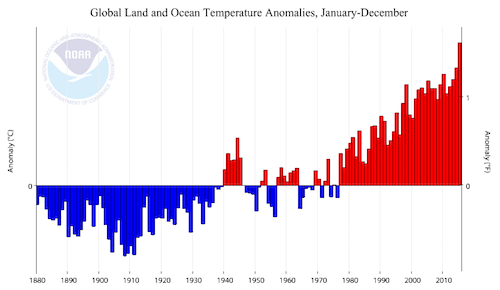 The image at upper right represents global land and sea temperatures from 1880 to 2015. It comes from the National Climate Data Center. There are still plenty of skeptics out there, but the science seems clear. We all know about rising sea levels, California wildfires, increasing droughts, acidification of the oceans and so on. But what are some of the likely impacts that we don't hear much about? For the Hawaiian and Pacific Islands, a warming climate has other kinds of implications. Marine debris, for example, can not only be a nuisance, an entanglement threat to turtles, an ingestion threat to seabirds, but a bunch of other things. Climate change can alter storm frequency, change current patterns, and move plastic debris into new parts of the sea and the coast, according to a study in the journal Aquatic Invasions. "Climate change may also increase the frequency and magnitude of storm activity capable of washing the immense amounts of plastic material now poised on the edges of the world’s coastlines into the sea," the authors write. Have a child interested in medical school? Suggest a career in treating parasitic worms. There's evidence that a warming climate will increase the populations and virulence in a range of nasty bugs that like to bore into human tissue. In the PLOS journal Neglected Tropical Diseases, there's this paper: " Global 'worming': Climate change and its projected general impact on human helminth infections." Not every nasty parasite will increase but many will, and some of those will be able to move into areas where they now don’t exist. And here's a word to get familiar with: ancylostomiasis. It is caused by a hookworm and can cause anemia in humans. Here's another: ascariasis, a disease caused by a roundworm. Both are expected to thrive in a warming climate. There are a lot of folks in the Midwest who have felt secure that climate change will impact them minimally, since, after all, they aren't going to be impacted by rising seas or tropical storm systems. But there's increasing evidence that they can expect disruptions, too. The Indiana Climate Change Impacts Assessment suggests that the growing season will be longer, but that with more spring floods and summer drought, the state might not be able to take advantage of it. Northern European forests will see big species changes, with declines in species like silver fir, beech, common ash and common oak, and a better habitat for alien species like the Douglas fir, red oak and black locust. With the change in species will come a dramatic change in the natural species that rely on those forests, said a paper in the journal Global Change Biology called "How much does climate change threaten European forest tree species distributions?" Should you get used to goat-milk ice cream? One research paper suggests that in a more extreme environment, goats present the best option for milk and meat. "Goats have numerous advantages that enable them to maintain their production under extreme climate conditions. Principally, goats have higher capacity than other farm raised ruminants to effectively convert some feed sources into milk and meat," write authors Nazan Koluman Darcana and Nissim Silanikoveb in the journal Small Ruminant Research. Additionally, they produce less methane than cattle, they write.